Philadelphia - You won’t need a calendar to mark the start of summer in the northeastern U.S. The National Weather Service forecast potentially record-breaking hot temperatures just as the season officially begins Wednesday, the summer solstice and longest day of the year. Readings are expected to approach or top 100 degrees Wednesday and Thursday in cities including Philadelphia, New York and Boston. Health officials warned residents to drink water, stay out of the sun and in air conditioning, and to check on elderly neighbors and pets. 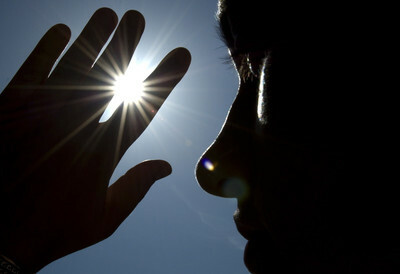 After enjoying relatively mild June temperatures, Philadelphia may see the mercury soar to 97 and 99 degrees mid-week. “You’re talking about almost 15 degrees above normal,” said Kristin Kline, a weather service meteorologist in Mount Holly, N.J. Normally, the high for Philadelphia at this time of year is about 84 degrees — closer to Wednesday’s predicted low of 80 degrees. The city’s highs in the next couple of days could break decades-old records of 98 degrees, set in 1931, and 99, set in 1923. The heat also will hit Boston-area residents hard. Triple digits are forecast in Boston — 101 degrees on Wednesday — followed by 99 on Thursday, the weather service said. Current record highs for these dates are 98 and 95 degrees, respectively. New York City’s 1.1 million public school students are still in session for another week, and just 64 percent of the classrooms are air-conditioned. Temperatures are expected to hit 97 in the city both days — about 20 degrees hotter than it was in Central Park on Tuesday. Forecasts for upstate New York on Wednesday and Thursday called for temperatures to break 90 from Buffalo to the Vermont border, with highs topping out in the mid-90s in some places. The cities of Buffalo and Rochester, N.Y., opened several spray parks on Tuesday to help residents cool off as hot, muggy weather settled in. Buffalo doesn’t normally open its 11 splash pads until July 1. Records might also be broken in central Connecticut. A Home Depot in West Hartford had stacks of air conditioners and fans ready to go, and city resident Sarah Savo was ready to buy one for her house. Philadelphia began a staggered schedule of opening its swimming pools on Monday, a couple of days after schools let out for the year. Nearly two dozen of the city’s 70 pools will be open by Wednesday, with another seven opening Thursday. “We’re very lucky that the pools opened yesterday,” James Garrow, a spokesman for the Philadelphia health department, said Tuesday. Officials will be setting up 114 “cooling centers” at facilities across the city, said Garrow. The Southeastern Pennsylvania Transportation Authority, the state’s largest transit agency, is keeping a close eye on the heat as well, spokeswoman Jerri Williams said. SEPTA, which operates trains, trolleys and buses in Philadelphia and its suburbs, planned to have extra maintenance workers to help deal with heat-related switch failures, problems with track expansion and any overhead wire issues on suburban train lines. Moderate relief from the high mercury should come this weekend. Yidden, don't keep your children locked in your hot cars when you run in for just a SECOND to the deli or bagel store.